So while I may be “health obsessed” I’m certainly not an expert. I’m sure I’m not the only one that struggles with knowing what to really believe, and what is ultimately best when it comes to food and nutrition. The fact that one of my favorite pastimes is watching food and nutrition documentaries may be a little weird, but no one can argue that education is empowering. With this flood of knowledge, however, I often become overwhelmed. Some of the documentaries I have watched include but aren’t limited to: Fat, Sick, and Nearly Dead, Food, Inc., Food Matters, Forks over Knives, and Killer at Large. Not gonna lie, these documentaries freaked me out, as they should. I started researching vegetarianism, veganism, and juicing. I have done tons of research on the Paleo Diet and it’s benefits, and all of these seem to be the perfect answer. The only problem is, they are almost polar opposites–so which one is better? Well my friends, that is up to you and your body to decide. I will, however go over a few differing views. I recently watched and took notes on the film Forks Over Knives, which advocates a whole food plant based diet. While I’m not prepared to go fully vegetarian (definitely not vegan I love eggs), the film raised some alarming points. Government guidelines for diet are extremely financially and industrially motivated. Example A: Former American Association of Dietetics President Connie Diekman is also the advisor to the National Dairy Council and this is evident in her public views on dairy. She states that we need calcium from milk and milk products to reduce diseases like osteoporosis. News Flash: We still have a lot of osteoporosis in the US despite being one of the largest consumers of dairy. Only a very small portion of cancers are caused solely by genes. Vegan, paleo, carnivore, or omnivore, we can all agree that nutrition is the best medicine we can give our bodies to help prevent diseases and promote overall health. One of the main causes of the overload of processed, sugar-laden, nutritionally deficient foods in US society = 1973 Farm Subsidy Bill: This bill provided incentives for massive increases in corn production, which ultimately led to heinous amounts of high fructose corn syrup being put in everything. MOE: Money Over Erry’thang. Excuse my ghetto, but a term often used by “gangstas” in rap songs also applies to the US Government. And guess what? Both of them are equally stupid. The dietary guidelines set for Americans are formulated by the US Department of Agriculture, whose main constituents are the farmers, not the American people. Milk is heavily subsidized (why we see so much in school cafeterias). The research behind national nutrition policies is corporately funded by the big corporations that want you to eat what they produce (meat, dairy, corn). The panel that actually forms these so-called “dietary guidelines” is only composed of 11 people. 11. 6 of those 11 have financial relationships with the food industry….can you say conflict of freakin interest? **Soapbox moment: It’s these kinds of issues that truly bother me. I love public speaking and writing, but I also love nutrition. As a student, I used to think these two could not go hand in hand. Recently I’ve discovered that it’s through speaking out about issues like this that my passions can work together. I want to advocate for healthy lifestyles, less processed foods, back to nature, more human treatment of animals, and more realistic nutrition information to the American population. It’s something I’m passionate about, and it angers me that the same government that was put in place to protect our rights is keeping us in the dark about what goes into our bodies, literally a life and death decision. Okay so being completely honest this film made me want to go totally vegetarian. BUT, Fat, Sick, and Nearly Dead had me wanting to go on a 30 day juice fast, and research on “leaky gut” being caused by grains as the Paleo Diet suggests makes me never want toast with my eggs again! So where does this leave me? Well there are two sides to every story, so I recommend you do research on both sides before going gung ho on a particular diet. While I think Forks Over Knives has some valid points, so does fellow blogger Denise Minger, and she definitely did her research before critiquing the film (see here). While juicing can be beneficial to add extra fruits and veggies to your diet and the occasional week-long cleanse can be beneficial, not everyone needs to go on as extreme a fast as Joe Cross or Phil Staples. And finally, while the Paleo Diet is great in its focus on whole, unprocessed, ancestral foods, there is still something to be said for increasing veggies and not just increasing protein (as many people do on the paleo diet). Like I said, overwhelming right? I think the main takeaway is that you need to find out what works for your body. For some more differing views check out this awesome website that compares all 3 diets. Everyone will have different results no matter which diet they choose. I think moderation is an important value that many people often neglect. The “go hard or go home” mentality sends people home discouraged more often than not. No one is perfect, no diet is perfect, and every day is a learning experience. So take everything with a grain of salt (but not literally). Speaking of moderation, I pretty much always eat a healthy breakfast. It’s just something that is engrained in me (no pun intended). Sunday’s are usually splurge day for breakfast though so today I whipped up some Buckwheat Pumpkin Pancakes and boy were they delicious! Then I took the puppy for a run on one of her favorite trails that goes down by the river in our old neighborhood. It was a good 4 mile run, but it was hard to keep a good pace with such rough terrain and steep hills. Despite being a little slower than usual, this kind of run is still good for my training to get used to all different kinds of terrain especially since I’m basically graduating from treadmill only runs. When I got back I refueled with a Papaya Ginger Mint Smoothie that was equal parts refreshing and digestively soothing. 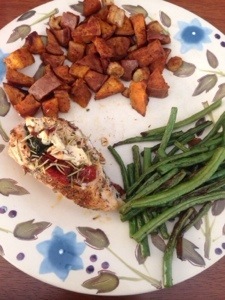 Dinner was my famous Sun-Dried Tomato and Spinach Stuffed Chicken Breasts with green beans (both of which you can find the recipe for here) and roasted root vegetables. Hope this post wasn’t too long I just felt it worthy of discussing. I’d love to get some feedback on what you guys think about all of this conflicting information and how you’ve made choices concerning your own diets!